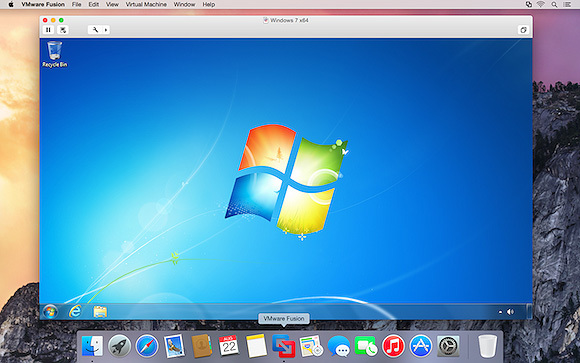 Following the launch of Parallels Desktop 10 last month, VMware has launched its new VMWare Fusion 7 virtualization software, bringing support for OS X Yosemite and improving compatibility with Windows 8.1. The release also adds a number of new features, including a new look, improved performance, enhanced connectivity, and optimization for Macs with Retina displays. Get a more Mac-like experience when running Windows applications on a Mac. The Fusion 7 updated Yosemite look and feel makes working with your Windows applications feel cleaner and more refined. Discover OS X Yosemite by running it in a virtual machine with Fusion 7. 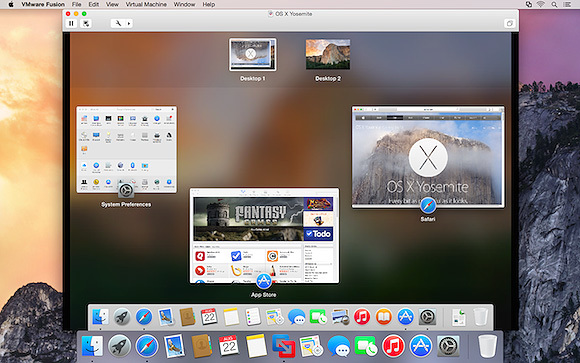 Get more from your Mac by running OS X Yosemite and OS X Yosemite Server in virtual machines. Leveraging decades of innovation in leading the virtualization revolution, Fusion 7 is the most reliable way to develop and test new applications for the Mac and iOS. Get the most out of Windows 8.1 new features directly on your Mac and run Windows Store apps side-by-side with your Mac applications. With Fusion 7, view Windows Store applications in Launchpad and the Applications folder or put Windows Store Apps in the dock in Unity mode. With a highly optimized 64-bit engine and multicore processing power that makes the most effective use of the latest Intel Haswell processors, Fusion 7 runs Windows and Mac applications side-by-side faster than ever. Windows never looked so good with Retina Display optimization for a crisp and detailed experience of your Windows applications. If your Mac has a native Retina display or is connected to one, Fusion 7 ensures you get a seamless experience when running Windows across Retina and non-Retina displays. The more advanced VMware Fusion 7 Pro has also been launched, bringing the same features along with dual GPU optimization, virtual network management, enhanced support for cloned virtual machines, and more. VMware Fusion 7 is available now for $69.99 while VMware Fusion 7 Pro is priced at $149.99. Those upgrading from VMWare Fusion 5 or 6 are also eligible for discounted pricing of $49.99 for VMWare Fusion 7 or $79.99 for VMWare Fusion 7 Pro. Can anyone give me just one reason, why to buy this if you want to run Windows on your Mac? We have Bootcamp and it's free - With VMware you have to pay for both Windows and VMware. VMware must be slower than running a real install. And it costs you more. You want to do something totally insane, like not reboot your Mac and run Windows apps right next to your Mac apps. I know. But with VMware you have to purchase Windows AND WMware. I still see no reason. When your work requires to use just one application that only runs on Windows, you will see how shelling out $80 (by your boss) is a world changing shift from rebooting every thirty minutes. you can run windows within mac. among other things. Where are all the comments like "annual subscription", "these upgrades should be free", "I will never buy from that company again" like we say in the Parallels thread? There is even less innovation warranting the upgrade prices in Fusion 7 than there is in Parallels 10. No one really wants to run Windows 8.anything on a PC, let alone on a Mac. Any Windows user or IT person I know either uses Win 7 Pro still or wishes they could. Well, I'm an "IT person" and I prefer Windows 8.1 (in desktop mode, if you want to call it that) over any of its predecessors. Why? It's MUCH faster than Win 7 or XP. It's more secure out of the box than any other desktop OS on the market. It's rock solid. All that being said - if you NEED to run Windows on a Mac - or a PC that is supposed to run Linux as its main operating system - you have chosen the wrong main platform for your daily work. You should have stayed with Windows, period. Virtualization is awesome - but as I've said, I'm an "IT person". I run dozens of production servers on a VMWare vSphere cluster. Solutions like VMWare Fusion are awesome for developers and for learning and testing purposes. But like I've said, if you NEED such a tool on your desktop machine to run an application that you NEED for your daily work - you should have chosen Windows as your main platform, period. It doesn't make any sense to double your platform complexity and maintenance costs just because you bought into some hype and decided to go with an OS that does not have the application software that you NEED. I NEED to run windows on a mac (visual studio), but I also NEED to run xcode. I don't want 2 machines, and I want to easily share data between the 2 platforms. There are use cases for parallels/vmware, otherwise why would people buy it (Also its a lot cheaper in hardware cost and support/backups/restore time to have a couple of virtual machines on one set of hardware, regardless of what operating systems are actually in play). VMware/Parallels/VirtualBox is a pretty good reason why you can choose OS X as your main platform. Sure, there are extra expenses, but there are plenty of reasons why you might prefer OS X for all your other stuff. Why should Windows keep such a firm grip on everyone, just because some proprietary software is not available on OS X? I can understand completely why some people would like to take this option. Moreover, it could entice more developers to bring their applications to the Mac. Complete cobblers, I have a bundle of Windows only access control systems I need access to on a daily basis. Some of them are well past their sell by date and only run under XP. Even if they all suddenly ran under 7 or 8 they cant be trusted to play nice together.Very few of them have ever been designed on basis they'll share a live install with a competing product. Likewise programing/diagnostics software for some of the door controllers and ancillary kit: Windows only and some of the serial based ones with particular COM port and baud rate requirements. Whichever way I'd swing it Id still be using multiple VMs for that aspect of my work. I'm neither paid nor interested in farting around for umpteen weeks coaxing them into working together under a single OS in a single install; something they'd never have to in their real world deployments. I might be in those VMs three hours one day, just half an hour the next. Having those apps dictate the OS I use for all the other aspects of my work is letting the tail wag the dog.